Madeline Puccioni’s ten-minute play, THE INTERVIEW, developed in PlayGround teacher Daniel Heath's class, will have a full production, June 6-28, in Sheherezade 2014 at The Exit Theatre. 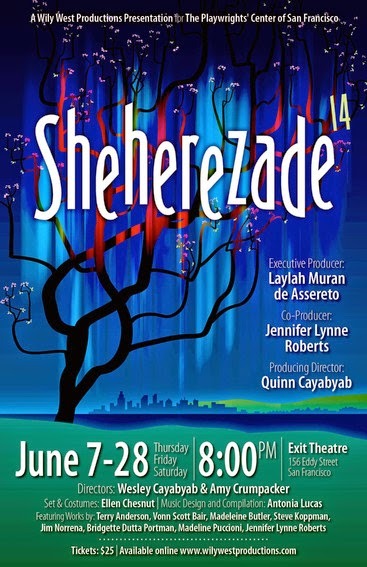 Madeleine Butler's play, THE BOX, will also be in Sheherezade 2014. Get tickets now! Lauren Yee's play IN A WORD will have a rolling world premiere at San Francisco Playhouse and Cleveland Public Theatre in spring 2015. Michael Barrett Austin recently performed in readings of Daniel Heath's Dust to Dust as part of the PlayGround Festival of New Works and Kate Ryan's The Worst with Just Theater's New Play Lab. A scene from Michael Dougan’s play, POPS, and Lorraine Midanik’s THE SIEGE will receive staged readings during the Stagebridge playwrights showcase on Monday, June 9, 7pm, at Ashby Stage. On Friday, June 6, Just Theater and The Cutting Ball Theater will co-present a staged reading of Andrew Saito's play Mount Misery, the name of a Maryland plantation where teenage Frederick Douglass toiled; 170 years later, it was purchased for a vacation home by Donald Rumsfeld. The reading is at 7pm at The Cutting Ball Theater at the EXIT on Taylor, 277 Taylor Street. Admission is free. 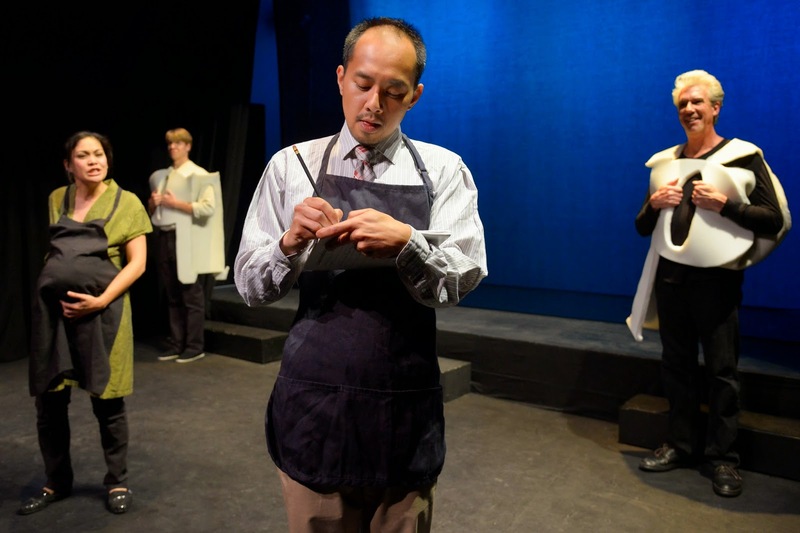 On June 14, 15, and 16, The Cutting Ball Theater will present a workshop production of five tries, a one-act play by Andrew Saito, directed by Addie Gorlin, that examines a genius scientist's successive series of attempts to create a human being incapable of suffering, loosely inspired by the Maya Quiché creation myth, the Popol Vuh. Showtimes are 7:30pm on Saturday June 14 and Sunday June 15, and at 5pm on Monday June 16. Admission is pay-what-you-can. Louis Parnell will be appearing in INTO THE WOODS at the San Francisco Playhouse from June 24-September 6, Tue-Sun. He’s also doing a number of readings on his Monday nights off. Great Beast will present “Subtle Whoring: Short Works by Cass Brayton” (a PlayGround resident playwright) at the Shadowbox Theatre in New Orleans, June 17,18, 24, and 25. Described as a “high-camp, high-style, high-flying Pride Month offering,” the plays include The Boy Who Did Not Listen to His Mother, premiered in the 2008 Best of PlayGround festival. Three of the five plays began life in Monday Night staged readings at Berkeley Rep.
M. Graham Smith is back from a teaching semester in Barcelona and is beginning rehearsals for an SF Fringe project, Deal With The Dragon by writer/actor Kevin Rolston. William Bivins's play Ransom, Texas will be produced by Virago Theatre Company, directed by Jon Tracy. Opens September 30th at Tides Theater, with an additional January run in Los Angeles at Theater Asylum. Zoe Young will have a short play in the ShotzSF showcase. Tuesday, June 24th at 8pm at Tides Theatre. The theme this month is 1977. Tickets are $10 and come with a beer/glass of wine. Inbal Kashtan’s Black Man Walking and Climate Change, two one-minute plays, will be part of FlashFest 2014 in NYC, June 15. Her 10-minute play, Don’t Play it Safe, will be read as part of Girl Play at The Women’s Theatre Project in Ft. Lauderdale, FL, June 27-29. Ross Peter Nelson's 10-minute play Timequake will be presented in Southern Rep's June production of 6x6, and one of his scripts will serve as the basis for an improv session at the June 20th performance of You Don't Know the Half of It. Rachel Bublitz has recently been named the Dramatist Guild's Young Ambassador for the San Francisco region. Additionally, Rachel's one-minute play Pepper is being produced with Playsmiths' Flash Fest in New York City on June 15th, at 7pm. For tickets and more information: http://www.brownpapertickets.com/event/684168. Brian Herndon is playing Mortimer Mortimer in FAILURE: A LOVE STORY at Marin Theatre Company, June 5-29. This fall, he’ll perform in FIRE WORK, a world premiere by Lauren Gunderson, at TheatreFIRST in Berkeley. Will Dao is currently in THE CRAZED at Central Works at the Berkeley City Club through June 22. See http://centralworks.org/thecrazed/ for more info. Will Dao, Rosie Hallett, and Carla Pantoja will be appearing in Harry Thaw Hates Everybody, directed by M. Graham Smith, at Shotgun Players this fall. Steven Westdahl recently began writing book and lyrics for a musical collaboration with local composer Dennis Aman and producer Kevin Brunetti focusing on the life and times of Adolphe Sax, inventor of the saxophone. Westdahl also continues to perform monthly at his live literature shows WRITE CLUB SF (at The Make-Out Room), Shipwreck (at The Booksmith), and the new Scene Missing (at The Cynic Cave) as well as weekly with the SF Neo-Futurists in Too Much Light Makes The Baby Go Blind (this year's SF Weekly's Readers' Poll winner for Best Theater).